Did you miss the Condiment Circus? I had the opportunity last week to teach a seminar on the trade show floor of the largest specialized catering and events conference in the United States, held at Mirage Hotel in Las Vegas, and at the Las Vegas Convention Center. Another chef was designated to teach this class, but was not available due to prior commitments, so I got the call. It was a great opportunity to summarize some of the flavor profile trends we have been seeing out here in California, and how they can be applied to catering menus for large and small caterers across the country. The first step in preparation was to Google this year’s food trends, though I was pretty confident that I knew what I would find. Many “new” ideas for the rest of the country have been on our menus in California for a couple of years, due to our vibrant and innovative restaurant scene and a heavy focus on diversity and local and sustainable foods. The usual things popped up, “farm-to-table”, small artisan producers, all the buzzwords. But how to translate this to a seminar entitled “The Condiment Circus: Three Rings of Flavor”? I set down the laptop and headed to our pantry to see what was on the shelf. In the pantry, I found Gochujang (Korean fermented chili paste), Mae Ploy Sweet Chili Sauce, gluten-free hoisin sauce from Wok Mei, a large bottle of Vietnamese fish sauce, salted Japanese dried plums (umeboshi), and a quart jar of preserved Meyer lemons that we use in preparing our vegetable tagine. Digging further, I found all-natural liquid smoke and blackstrap molasses, which we use to approximate the flavor of bacon in vegan preparations, and an assortment of finishing salts. On the counter were a full slate of Stella Cadente Olive Oil’s crushed flavored California oils, and more salts and salt blends. A trip to the reach-in yielded our Korean BBQ sauce, house-made Romesco and a couple of jars of fruit mostarda that we prepared to accompany roast pork. Now I had a basis for a seminar on condiments. A list was assembled for the event organizers (all the condiments had to be readily available, either through foodservice distribution or via the internet, mostly from Amazon Prime). Many of the caterers at this conference were rural and small market, like myself, and did not have access to the well-stocked ethnic grocers found in larger urban areas. I dug through my recipe files, and came up with half a dozen recipes, complete with photos, of ways to integrate these condiments and flavor profiles without scaring our clients into the woods. I included the recipe for the Korean BBQ sauce, plus a couple of recipes for appetizers using it. A recipe for a baby chicory and beet salad with a robust vinaigrette pulled in the Blood orange olive oil and the sweet chili sauce. Of course, the crowning glory would be our vegan eggplant “bacon”, a recipe inspired by a Pinterest find when researching vegan brunch ideas. I added our recipe for Romesco, even though we would be tasting a retail version, and a couple more photos of dishes using some of the other items such as the finishing salts. The main focus of the seminar was to have the attendees taste each of the condiments, then taste some of the foods derived from them. This meant tons of little dishes and spoons that had to be laid out in order in the back of the house, set for 30-50 attendees. Setup took me most of an hour and a half, but we were finally ready. Up to the mike, assistants all set to pass out the tasting portions and off we go. The first taste was the Gochujang, a fermented bean and chili paste from Korean that is as ubiquitous as catsup is in the United States. It has a nice heat, balanced with the complexity of fermentation, and strong notes of umami. It was accompanied by a taste of the Korean BBQ sauce, made based on the Gochujang. The sauce also included brown sugar, tamari, toasted sesame oil and rice vinegar. Everyone loved how the other sauce components tempered the heat and the resultant sauce could be used in a variety of ways. The second taste was the Thai Mae Ploy Sweet Chili Sauce. This was an easy one for most of the attendees, as it has a nice balance of sweetness, heat and acidity. This was followed by the Vietnamese fish sauce, which can be used as a shelf stable substitute for anchovy in many recipes. Next up was the Japanese salt-dried plum, which we use to flavor steamed sticky rice as a side dish for Asian inspired pork dishes. While the plum itself is salty and astringent, the finished rice reflects the subtle fruitiness and aromatics of the plum. The last Asian inspired taste was the hoisin, noted as a great way to bring Asian flavors to BBQ sauces. On the same spoon as the hoisin, the attendees tasted blackstrap molasses, as a segue into the north American market basket. They noted the similarities in the flavors, bitter plus sweet plus umami, and how each culture used these flavors in certain ways. They then were given a tiny spoon of the liquid smoke. We discussed the recognizable flavors in bacon and other preserved pork product (salty, sweet, bitter, smoky) and we presented a taste of the vegan “bacon”, thinly sliced eggplant painted with a mixture of the molasses, liquid smoke, maple syrup and tamari, then baked in a low oven until crisp. We followed the bacon with the flavored olive oils, both the Blood orange and the basil, and discussed how these could not only be incorporated into dressings, but used as sauce replacements and in marinades. We then moved to the old-world market basket, with hot harissa and the preserved lemons from Morocco, discussing the use of these condiments across the southern and eastern Mediterranean. Everyone was struck by the influence of the Arabic world in even new world cuisines. The next taste was traditional Mostarda di Frutta; whole baby fruit preserved in sugar syrup and hot mustard from northern Italy. Noticing the likeness to chutney, the attendees were quick to grasp how this could be flexible enough to move from the cheese and charcuterie plate to the entrée, especially with roast meats such as chicken and pork. The last tastes we enjoyed were the finishing salts. We presented two Hawaiian salts, the dusty pink Ali’i and the black lava salt. Both are great for garnishing, both with color and their earthy mineral flavors. We love using the pink salt on a big basket tray of steamed edamame, and use the black salt in many of our passed appetizer where the color is a counterpoint to the ingredients presented. The next salts tasted were our house-made duck salt and porcini mushroom salt, and we discussed using our spice grinder to prepare these from on-hand ingredients. A very effective method to use when layering flavors. Our example was a recipe for duck confit risotto; made with duck stock, shredded confit duck meat, sautéed in duck fat, and topped with a quenelle of duck foie gras. The finishing touch was a sprinkling with duck salt (the rendered skin pulverized in the food processor then mixed with kosher salt). The last salt tasted was SaltWork’s Salish alder-smoked sea salt. We use this salt frequently to finish plates of roasted or grilled meats, especially beef, as it brings out the flavor of the cooking method in a subtle way. Discussion ensued during the question and answer period about the differences and commonalities in the various cultures and their condiments. Everyone left with new ideas and inspirations to take back to their own kitchens. For presentation materials, see below. Contact us via email at info@assaggiare.com for recipes. For information about Catersource/Event Solutions conference and trade show, click here. 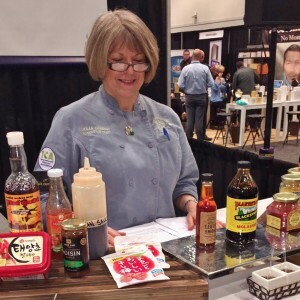 All of these condiments can be used to layer flavors in a dish, bring out specific notes in the flavor profiles, replicate flavors from other types of foods, enhance specific elements of flavor such as umami, sweetness, astringency and acidity. Condiments available on Amazon Prime unless otherwise noted. Chicken….it seems like the perfect food, right? Reputed to be simultaneously budget-friendly, easy to prepare and popular; many clients ask for it on their event menus. The surprising fact about chicken in a banquet context, it is often neither inexpensive nor easy to prepare. How many bad “mystery” chicken entrees have you endured at weddings, parties, galas and BBQ’s? Who can forget the boneless, skinless roast chicken breast that seems to grow in your mouth as you chew? How many times can you remember tasting chicken at a large event that was savory, flavorful, juicy and tender? In the kitchen, chicken goes from hero to zero in a matter of minutes. The most popular form, the skinless and boneless breast filet, has no internal fat to baste the meat as it cooks. Thought to be a frequent source of food poisoning, chicken must be cooked to an internal temperature of at least 165F. This almost guarantees that a breast filet will be dry and tasteless. On the other hand, legs and thighs are perceived to be less elegant, more suited to a picnic than to fine dining. In fact, a chicken thigh is the one piece of the bird that stands the greatest chance of remaining supple and juicy when cooked to a safe temperature. However, it is often red or pink at the bone, even when cooked to the proper serving temperature, causing guests to suspect it is undercooked or even raw. Chicken’s saving grace as a banquet entrée is its portion size. A single 6-8 ounce portion (breast or thigh) serves one guest. How many other proteins arrive in the kitchen already portioned? If you choose to serve whole roast chicken at a function, you are faced with either carving to order or hacking the bird up Chinese-style into serving portions. Neither option is particularly attractive or easy to serve to a large group, especially if the meal is served plated. In an attempt to add flavor to a commodity boneless, skinless chicken filet, chefs resort to stuffing, pounding, stewing, frying or saucing. The net result is stunningly predictable; dry and mealy meat swimming in a flavorful fat or sauce. In kitchen parlance, boneless, skinless becomes “b/s,” and we all know what B. S. really means. I have yet to meet a chef that really enjoys preparing boneless, skinless chicken filets. While enjoying fine dining status in the early 1980’s (as the chicken paillard, a thinly pounded cutlet seared and served hot from the pan with a light sauce), this cut is noticeably absent on restaurant menus outside the mainstream chains. Favored by cardiologists and dieticians for its low level of fat, this cut is almost impossible to serve flavorfully outside the a la minute environment of a small restaurant. The only way to add moisture is to brine, adding enough salt to send a chill down the spine of any self-respecting health professional. Yet are Americans just accustomed to dry, white chicken meat on their plates? At a recent event, we prepared an apple stuffed boneless, skinless breast roulade; roasted, sliced and sauced with a cider-mustard beurre blanc. The guests consumed it with gusto, but while tasting a slice in the kitchen, I personally found it dry, mealy and insipid despite the well balanced flavors in the sauce. As an experiment, I prepared the same dish using skin-on boneless breast filet and boneless, skin-on chicken thighs. The skin-on breast was juicier, but still largely dry. The skin-on thighs were unctuous, savory and tender. The crisp skin provided a necessary counterpoint to the tender meat and moist stuffing. It was almost as if the meat of the breast filet actually pulled moisture out of the stuffing, leaving the entire entrée somehow unfinished, even after the addition of sauce. The thigh, on the other hand, remained moist and delectable even after three days in the cooler and reheating in the microwave. As a requirement of our food safety training, chefs are taught not only to cook potentially hazardous foods, such as poultry, to the correct finish temperature; but we are also taught to record the cooking temperature, conditions, time and finish temperature in order to maintain a controlled process . As a result, we are very aware of how chicken is cooked before serving to the customer. Yet time and again, chicken legs and thighs are sent back as “underdone” or “raw” by guests. In our kitchen, we actually increase the cooking time and look for a finish temperature of 180F at the bone in legs and thighs, hoping to produce a finished dish that is delicious as well as visually appealing to the customer. When a client begins menu discussions, chicken is almost always on the list. As a result of our experience, we have begun to discuss not only the presentation and the flavors with our customers; we also discuss the cuts and methods of preparation. 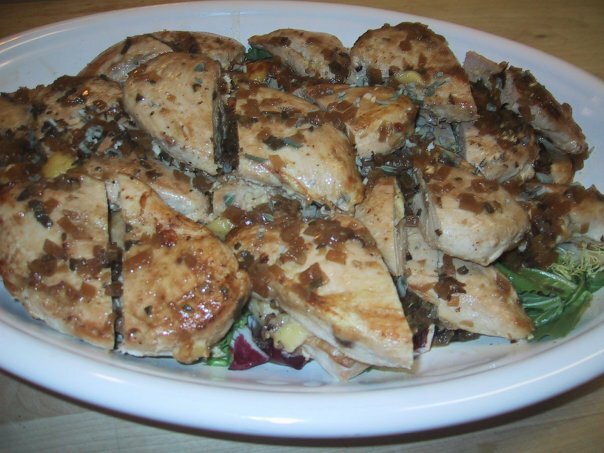 An added complication today is that many recipes for boneless skinless breast filets also include a crust or coating of nuts to make up for the lack of fat in the meat itself. With the emergence of nut allergies as a concern, we have been forced to look for new ways to add flavor and texture. Many of our tastiest recipes for chicken are not pretty on the plate or platter. In buffet service, the use of chafing dishes and other means of keeping chicken at a safe serving temperature almost guarantee it will be overdone for at least half of the guests. We have found the best way to preserve the texture and flavor of chicken on a buffet is to serve it over a vegetable sauté or braised white beans with greens. The moisture in these items helps maintain moisture in the chicken, and the layer of food underneath insulates the chicken itself from the drying heat of the pan. For plated meals, we prefer roulades or stuffed pieces that can be shingled or cut offset to display the filling, then sauced. Our ultimate aim is to see that our customers get a preparation that will meet or exceed not only their expectations, but those of their valued guests. This means we do a lot of talking about chicken, and we ask a lot of questions. Ultimately, a tasting may be the best way we, as caterers, can address the chicken conundrum. Under these conditions, we can serve the same recipe prepared with different cuts, or with skin on or off. When a customer actually tastes the difference, most agree with our recommendations and swap out the boneless skinless breast filet for another option. After all, we really want the same thing; happy and satisfied guests who feel they have been treated to an exceptional and celebratory meal, while still respecting the customer’s budget preferences.